rdp clipboard sync doesn't work anymore. [Impact] This bug has been quite active for some time. Its just a fact that missing clipboard redirection is a blocker for this app. [Development Fix] The current remmina version (1.0.0-1ubuntu7) in Quantal has the same patch added. [Stable Fix] The patch for fixing this has been attached to this thread. => Normally the content should be synced, but this is not the cause. [Regression Potential] before Precise we had rdesktop as RDP client. This client had support for clipboard redirection. But as Remmina is now the default RDP client, alot of people are missing this feature. Looks like it broken by remmina developers. I confirm existence of this bug on Fedora 16 with x86_64 architecture. Very uncomfortable. Other than that, Remmina is just fine. Confirmed in Ubuntu 12.04, remmina 0.9.99.1. I'm too am experiencing this bug; I can't cut and paste text from Ubuntu to a RDP session. 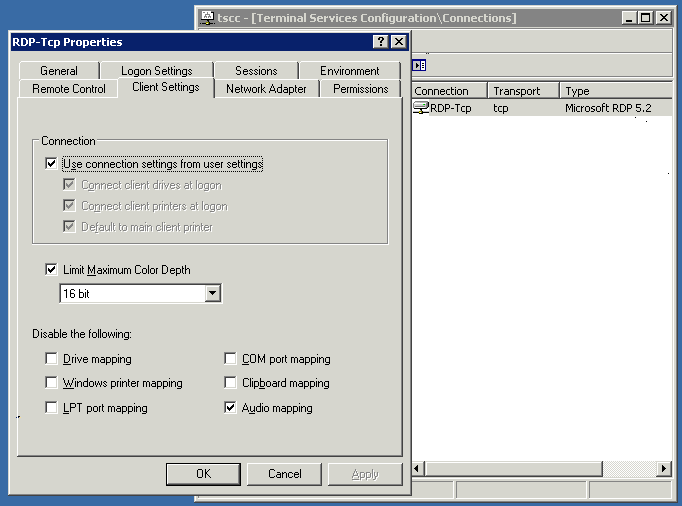 You can see, in the attached-png-image, that the Windows 2003 server does NOT have clipboard mapping disabled. Clipboard mapping is also NOT disabled in the RDP profile under the Advanced tab in Remmina's Remote Desktop Preference dialog. Given this, clipboard mapping should be working, but it is not. I confirm this with Ubuntu 12.04 beta2 for both unity-2d and unity-3d. I also confirm with KUbuntu 12.04 beta2. This bug is an important one for me. Not being able to copy and paste into (and from) the remote desktop really messes up my workflow. Wanted to add that the scroll wheel doesn't work inside of Windows' windows either. Yes, I have the same issue with the non working scroll lock. The scroll issue is some other bug in Remmina. This can be checked in https://bugs.launchpad.net/ubuntu/+source/remmina/+bug/952964. For the people having the clipboard issue. Is the clipboard working for VNC connections? I'm working on a patch to implement Clipboard support in Remmina. The clipboard does work for VNC connections. I can confirm this bug is still present in 12.04 LTS. I can also confirm this bug on 12.04 with remmina 1.0.0-1ubuntu6 from precise-proposed. Please fix as it makes RDP almost useless. Thanks for all the hard work! I can confirm this bug is present in xubuntu 12.04 LTS. Confirm on KUbuntu 12.04 LTS. Confirmed on 12.04 LTS release with Remmina 0.9.99.1. Still not working on final. For people interested. I uploaded a package to my PPA (https://launchpad.net/~dupondje/+archive/ppa) which includes clipboard support. This should work without issues. If you find some strange things or bugs, report them to me please. Clipboard support is working again with the updated version from your PPA. Thank you! This has also resolved scrolling within the server as well; however Viewport fullscreen mode does not scroll when cursor is brought to the edges on high resolution instances, Bug #955018; most importantly, thank you, very much appreciated! Dupondje PPA fix above has resolved copy/paste as well as scrolling in 12.04 LTS with Remmina 0.9.99.1, thanks! Successfully built from git. Clipboard is working on arch linux. Thank you for the fix. Will this fix go also updataes or proposed? I updated with the preposed package last night; it fixed the scroll-wheel issue (https://bugs.launchpad.net/bugs/952964) for me, but not cut and paste. I just tested "cut and paste" again (right now); it is NOT working. I went to Remmina's help menu and "about" it says I'm running version 0.9.99.1. So, the PPA fix is not in the proposed update that fixed the scroll-wheel issue. When will all these fixes likely go official (so that the masses will get the fixes :) ? PPA fixed clipboard and scroll wheel. Thanx! But noticed one charset issue. All works when copy-pasting from Ubuntu to remmina RDP window. But when copy-pasting from remmina RDP window to Ubuntu, text with scandinavian letters comes likes this "\Uffffffff". Remmina is crashing now for me, when trying to make "Paste" operation, using fixed version from PPA. I'm using gnome-fallback and compiz. Same for me. PPA version crashes from time to time (no need to be copy/pasting or anything like that). Any idea are this bug-fixes going to be made available on a stable release coming through ubuntu approved repo? * debian/patches/clipboard.patch: add clipboard support. I saw the new update for remmina last night and installed it and clipboard synch worked as long as I put something into the clipboard from the client side first. I also used it this morning on a remote job site without problems. However, once I got back to my office, I found that all clipboard sych was disabled in all my machines. These are running ubuntu 10.04, 11.10, 12.10, some are 32 bit, some are 64 bit. Also, I use terminal services client, krdc and remmina in various machines. They all worked yesterday, but none of them work today. All clip board synch everywhere is now disabled and I am dead in the water.......The server is running Windwos XP SP2 and all the clients are Ubuntu of various releases. Any thoughts on where to start fixing this would be appreciated. OK, The one thing I didn't think of was that the one common thread in my problem was Windows. I have been having so much trouble with remmina that I just kept assuming Windows was fine. In this case, it was the Windows clipboard that had failed. It would not copy/paste anything within itself, never mind over a remote connection. Once I restarted my Windows session, every thing started working again. Thank you for the fine work in resolving the remmina clipboard bug, it is usable now. The only remaining glitch is it should not need to have something in the buffer from the client side first. It never needed that before. I am using the new Remmina version released and it work very good now. The only thing is that i had to delete my folder .remmina in my home directory in order Remmina works with the copy and paste of the clipboard. I have similar problems. 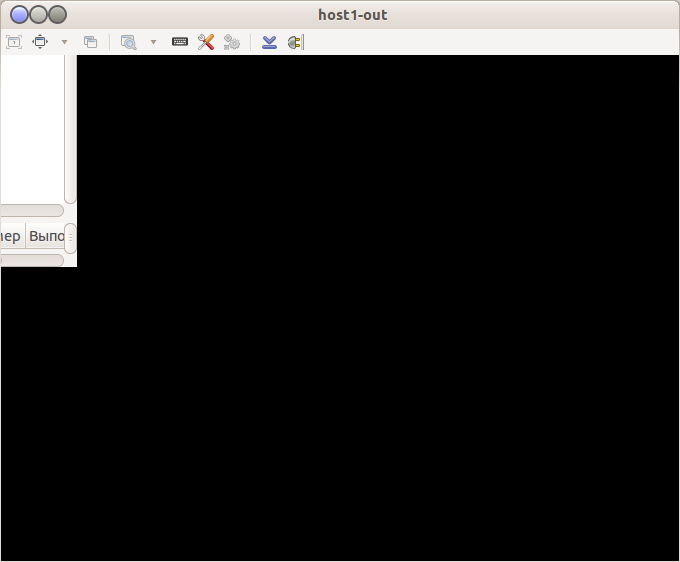 Ubuntu 12.10, VNC, clipboard sync doesn't work properly. I agree that a Remote Desktop Viewer has to handle copy/paste correctly in order to be usable. This is a very irritating bug for me. Tried to install the patch but was unable to do so in graphical Synaptic. In order to install the patch Synaptic demanded to uninstall all other remmina packages, if I accepted that, after having applied changes, the program itself (as expecte) disappeared. - remote->local: sometimes only the first char of the copied text is pasted (pasting again remotely correctly pastes it all, so it really is in the remote clipboard). But this problem is intermittent. Sorry, my Ubuntu version is *12.04*. This is still an issue in 12.04 using remmina-common 1.0.0-1ubuntu6.1 !!! Copy/paste is completely broken when connecting to a Windows XP machine over RDP. This may be a problem on the Windows machine itself. There are 2 things to try. First, put something in the clipboard by "ctrl-c ing" any random text on your local Linux machine before trying to copy from the XP box. If this works, then I agree, its' still a bug in Remmina, even if the dev says it's normal behavior. Second, the XP remote clipboard in Windows may be hung. I have found this to be a problem NOT exclusive to RDP in Linux. It is also reported as a long standing problem in all Windows OS's when running RDP. Once you have the remote session open, run the Windows task manager (right click the task bar and select task manager) and look for the process rdpclip.exe. End task on this process and then at the top of the task manager window, click on File > New Task (Run) and enter rdpclip.exe in the dialog box and run it. Now try your clipboard and see if it is working. If that fixes it for you, then it's a Windows problem. I have created a small batch file that I leave on the Windows desktop that I can click on to quickly end and restart the rdpclip.exe. I actually got this info from a Windows discussion site where many people who only run Windows were having the same problem. There are several possible workaround one of which involves killing the rdpclip.exe "process" in Windows Task Manager then restarting it. I also tried that but it did NOT fix the problem with RDP session Cut&Paste . Rdpclip.exe is ONLY used for Remote Desktop session redirection of clipboard. Locally on Windows it Cut&Paste works between programs running on the same machine while you are logged into the machine. But reading the above thread... my guess is this may end up being a Microsoft problem. That is why I made the batch file on the Windows desktop. Sometimes I have to hit it 2 or 3 times to get the clipboard to start working again. The other thing is to make sure you have something in the clipboard on the local side first. Just copy anything into the buffer from the local machine before trying to copy from the remote machine. the files I installed for 12.04LST x64. Once you uninstall the current Remmina packages and then install the older ones you will have to log out of your Gnome session and then back in again to use it. Seems that it is fixed oly half-way - clipboard is working in way remote -> local, but not in opposite way. interface. Currently RDP, VNC, NX, XDMCP and SSH protocols are supported. Just update about previous - Clipboard is working two ways on windows remote host, but on linux based hosts it is working only half-way, as I described above. and you have the same effect - remmina then can transfer clipboard again. Seems to have the same effect as tsclient (which is not existent any more in the repositories). > any more in the repositories). > rdp clipboard sync doesn't work anymore. > that missing clipboard redirection is a blocker for this app. > Quantal has the same patch added. > => Normally the content should be synced, but this is not the cause. > [Regression Potential] before Precise we had rdesktop as RDP client. > This client had support for clipboard redirection. I meant: If you install rdesktop, clipboard transfer in remmina works again. > > any more in the repositories). > > rdp clipboard sync doesn't work anymore. > > that missing clipboard redirection is a blocker for this app. > > Quantal has the same patch added. > > => Normally the content should be synced, but this is not the cause. > > [Regression Potential] before Precise we had rdesktop as RDP client. > > This client had support for clipboard redirection. That's strange! I thought that remmina uses xfreerdp and not rdesktop. I've just been using rdesktop from the command line. > That's strange! I thought that remmina uses xfreerdp and not rdesktop. > I've just been using rdesktop from the command line. Maybe it's just one of the keymap files. Maybe Remmina reads those (just a wild guess). in 12.04 32-bit, I had rdesktop already installed. I did an apt-get purge rdesktop and apt-get install rdesktop and it made no change in remmina. I cannot use clipboard services. > remmina. I cannot use clipboard services. Don't ask me why - I did now find the clipboard not working again. I am on Ubuntu 12.04 LTS, pretty up-to-date (I installed all updates two days ago, 12/19/12) and I have the latest rdesktop installed, and I think the latest Remmina (or latest as of 12/19/12), and copy/paste from within a remote machine and my local desktop, or between two different remote machines, does not work. Would love to see a fix for this get released soon, this is pretty crucial functionality. Man I so *love* computers... So I just shut down and restarted Remmina and I tested copy/paste within a remote window- works, as before. Then I tried pasting to my browser on local desktop AND IT WORKED. So, um, great job guys! That will teach me to submit a bug report. When copying to the remote-desktop only the first clip is copied. After I put something in the clipboard on te remote machine I cannot copy from the local machine anymore. Copying from the remote to the local machine does work. I am on ubuntu 13.10 client, xubuntu 13.10 (headless) server. The client has Remmina 1.0.0.4 installed (confirmed with synaptic), although the 'about' reports only 0.9.99.1 for itself and all plugins which is most confusing. The server has xrdp 0.6.0-1 installed. I cannot get copy and paste from client to server, or vice-versa, to work. I have tried the Right Control ('Host') V and C to no avail. It is most frustrating, to say the least. Am I missing something or should copy and paste just work with this version? Using a fully updated Ubuntu 14.04, I've begun to experience this bug again lately. I'm able to do copy and paste with rdesktop (logging into the very same servers where Remmina is failing to provide copy and paste between my remote sessions and local desktop). Has anyone else recently began to experience this bug again? I have never got copy & paste between client and server to work with Remina. I'm also on up-to-date 14.04. I have the latest Kubuntu 14.04. Recently all rdp clients began to ignore clipboard both ways. Remmina, rdesktop and KRDC as well. I've experienced the same thing on Ubuntu 14.04 and Remmina - copy and paste does not work anymore. Last week when the machines were first setup for the users, we did a demo for them which included copying and pasting text back and forth, this worked seamlessly, this week, this same functionality does nothing. I've tried Right Control and switching the imput grab back and forth to no avail. experiences the same issue. So this seems to be a Windows-issue. > paste does not work anymore. > this worked seamlessly, this week, this same functionality does nothing. > But as Remmina is now the default RDP client, alot of people are missing this feature. I no longer had this problem when I reverted back to an older version (process described in my earlier comment) under Ubuntu 12.04. As well, this issue is marked as "resolved" so the developers feel the fixed the bug and presumably pushed out a new version. If this bug is STILL occurring to you running the latest release of Remmina on 14.04 for example, maybe this bug should be reopened? > bug and presumably pushed out a new version. > Remmina on 14.04 for example, maybe this bug should be reopened? I confirm this bug, although repaired in previous versions of Ubuntu, is back again in Ubuntu 15.04 Vivid. Copy and paste between remote and local desktops is not working (again). This is a critical bug in Ubuntu 15.04, should I create another bug report, or is this going to get seen? Displaying first 40 and last 40 comments. View all 153 comments or add a comment.